Living in Seattle gives you access to almost any outdoor recreation imaginable, including camping and hiking, kayaking, white water rafting, rock climbing, skiing and snowboarding. For more information see the Living in Seattle page. 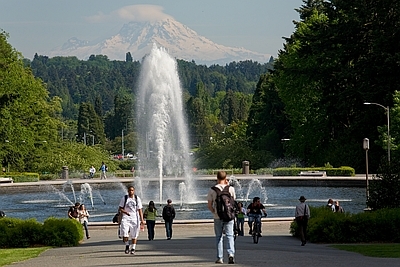 Not much is better than student life at the University of Washington. For more information to get involved, see the UW Groups and Activities page. The Department of Rehabilitation Interdisciplinary Student Organization, known as DRISO, focuses on promoting interdisciplinary and interprofessional collaboration in rehabilitation through the catalyst of student action. 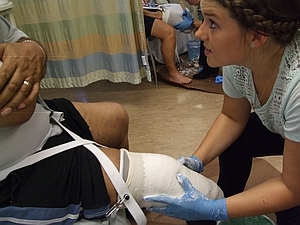 This registered student organization provides opportunities for students in physical therapy, occupational therapy, prosthetics and orthotics, speech and hearing sciences, and rehabilitation science to participate in a variety of activities, including service learning, extracurricular educational programs and social engagement from an interdisciplinary perspective. For more information, visit the DRISO website (UW NetID required). Students can also take part in service learning through the student organization Global Rehabilitation Organization at Washington, more commonly known as GROW. GROW developed from a shared interest in global health and community outreach among students in the Department of Rehabilitation Medicine. The goal of the group is to inspire rehabilitation professionals to become more engaged in their communities and play a part in building a better world. Student Health Insurance: As a student in our program, you will be involved in clinical rotations in the community starting summer quarter of your first year. Since you are not considered an employee of the clinical site while on rotation, you are not covered by the site's Worker's Compensation plan. You are encouraged and advised to obtain comprehensive health and accident insurance to provide you with coverage while at the clinical rotation site, as well as for your own health needs. Furthermore, many affiliation sites now require a student to carry health insurance. For more information on Medicaid and Healthcare Exchanges, please start here: http://www.washington.edu/ship/affordable-care/. Residency Requirements: All graduates of the prosthetic-orthotic professional phase curriculum must complete a 12-month residency program accredited by the National Commission on Orthotic and Prosthetic Education (NCOPE) in cooperation with the Commission on Accreditation of Allied Health Education Programs (CAAHEP) to become eligible to apply for the American Board for Certification in Orthotics, Prosthetics, and Pedorthics (ABC) examinations. Residency programs are one year in length for each discipline and are available at various sites throughout the United States. Approved programs are listed on the NCOPE website. National Certification: The American Board for Certification in Orthotics, Prosthetics, and Pedorthics (ABC) is the national certifying and accrediting body for the prosthetics-orthotics profession. After students graduate from the program and complete an NCOPE residency in each discipline, they are eligible to sit for the certification examinations. Washington State Licensure: The Washington State Department of Health (DOH) oversees the licensing of prosthetist-orthotists as set forth in WAC 246-850-020. To qualify for licensure, applicants must possess a baccalaureate degree or have completed a certificate program in orthotics and/or prosthetics. They must also complete an NCOPE residency for each discipline and obtain passing scores on the ABC written and written simulation examinations administered after July 1, 1991. These requirements are subject to change and updated information on the orthotics and prosthetic rules can be found on the DOH website.